Which Paul Are You Gonna Believe? Debated Representative Paul Ryan this AM on CNBC. We agreed that there’s a lot to like about Wisconsin but that was it. To me, his program is an amalgam of trickle down, whack the poor, further enrich the wealthy, weaken social insurance, and push YOYO over WITT (“you’re on your own” versus “we’re in this together,” see here). Other than that, I like it. Anyway, in the part of the argument where Rep Ryan argued that market forces would drive down health care costs, I pointed out that, in fact, health care spending has been growing more slowly in the public (Mcare, Mcaid) versus the private sectors (yes, too fast in both, but you get the point). He and others said no. Clearly, they’re not reading Krugman, which is their first mistake. Here’s another look at average annual price growth over the past decade (sources below). This stuff ain’t hard to find, unless you’re trying not to run into it. Share the post "Which Paul Are You Gonna Believe?" 13 comments in reply to "Which Paul Are You Gonna Believe?" A couple of corroborating points. Firstly, Chris Van Hollen pointed out in a debate with Rep. Paul Ryan that Medicare Advantage grows faster than traditional fee for service Medicare. One point Rep. Ryan made was that in his premium support plan, there would be guaranteed coverage options like in Medicare Advantage. It’s worth noting that Medicare Advantage has not proven good at combatting adverse selection. Question for the entire Washington establishment: why are you so scared of Paul Krugman? Uhm, if public health costs are rising faster, why do we need to pass a “doc fix” every year or so? 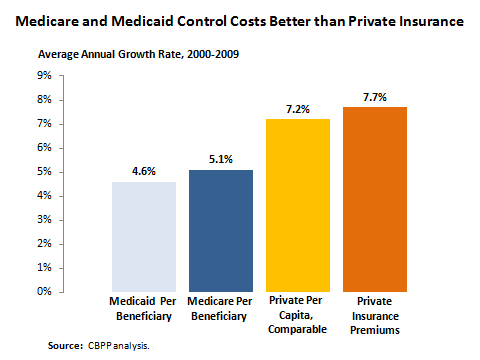 Because the private sector doesn’t need a doc fix for its higher increases? My husband and I have separate policies – as we were both self employed and bought separate, yet identical plans. We can testify to the fact that our Anthem PPO rates have more than doubled since 2006 and grown 284% since 2003. We are in our 60s and healthy. Neither of us has ever been hospitalized for illness, nor do we have a major illnesses, yet – our premiums continue to rise. Anthem gives 4 reasons for the second huge rise in a year. It’s even worse – they literally changed our policy from $1500 deductible to $1750 deductible with higher per visit co-pay and prescription co-pay and maximum. We still have to get pre-approvals on everything. It usually entails our doctors needing to send letters explaining why we need to have tests performed. Why??? What in Ryan’s plan will stop my premiums from skyrocketing? They’re trying to stop Health Care Reform, which will offer insurance to many at competitive rates. If I could change insurance companies, I would – but I’m stuck. I get Medicare in 2012. My husband in 2013. We can’t wait to be able to see a doctor without being gouged by a corporation that has nothing to do with my health except trying to spend as little as possible on maintaining it and collecting $thousands in our premiums each month while paying $30 here and there. We, as Americans, need to stand up for our rights as citizens of a great country that has always respected and taken care of it’s people. So, was his theory that you were lying, or that you’re incompetent? Of course Krugman is right. He’s right about most (but not all) things, in my humble opinion. I guess someone robbed a bank to get health care. That’s just sad and a shameful comment on the US. I don’t know in how many other western countries this would happen. I lived in Europe for awhile, and my goal is to eventually expat somewhere in Europe permanently. You know, find a nice European boy and live a nice European life away from the insane materialism of this country. I used to defend the US when Europeans criticized it. One of my close relatives, who lives in France, likes to on about its socialist health care, and I would get defensive because my patriotic side loves this country. This won’t change; the US has a lot going for it, but that doesn’t mean I want to live here forever…. A comment re fraud in public healthcare system v. in private. There’s more than one way to steal money from the system to keep for your own enrichment (private system profits), and these ways may not involve fraud, but they are certainly just as destructive to the healthcare system as fraud is to any system. It is now standard protocol for healthcare providers (hospitals, clinics, medical offices) to file the same insurance claim THREE times. First time, denial with zero applied to patient’s deductible and zero in negotiated amounts. Second time, same outcome as first time. Third time, the insurance company will OFTEN allow service to be included as a benefit with at least partial payment, will offer negotiated rates, and will apply the remainder to patient’s deductible. So this isn’t fraud per se, but give me a break. It’s the supreme runaround in an organized effort to deny payments by the private insurer. As the holder of a private insurance policy with a highly recognizable company for almost 20 years now, I have experienced this, as well as other underhanded ways to keep from paying on claims, personally on NUMEROUS occasions. whats the facts about millionaires receiving health subsidies for children…yay or nay? Has that CNBC blonde taken this on board? I just saw this debate. I can’t stress enough how shallow Ryan’s claims appear on the face of it. Republican ideas are devoid of any support due to evidence or robust theory. One thing that would have been really sweet to see if if Mr. Bernstein had the many easily available charts that put the lie to Republican assertions on Medicare, health care, the budget, etc. I don’t want to appear presumptuous, but I would suggest taking several of those to every major media appearance in order to get across the points easily to an audience that leaves a more visual and lasting impression.